Apple CEO Tim Cook will give the keynote address to graduates at George Washington University this May, the university announced today. Cook will speak on May 17 on the National Mall and was nominated for the honor by students earlier this year. The university also plans to give Cook an honorary doctorate of public service. "I am delighted that Tim Cook has accepted our invitation to give this year's commencement address on the National Mall," George Washington President Steven Knapp said. "I know our graduating students will be inspired and enlightened by his reflections on the lessons he has garnered from his distinguished career as a highly effective leader at the forefront of technological innovation." 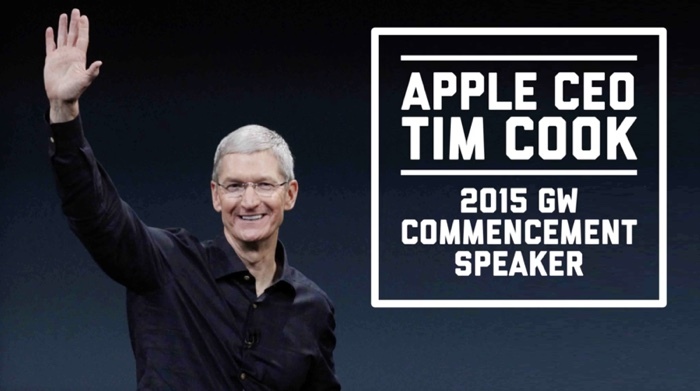 Cook's last commencement speech took place in 2010, at his alma mater Auburn University. At the time, Cook was Apple's Chief Operating Officer, and he took the opportunity to call working at Apple "the best decision I ever made." He gave a moving speech that emphasized the importance of intuition and how it led him to Apple. Previous commencement speakers at George Washington University have included actress Kerry Washington, former New York City Mayor Michael Bloomberg, First Lady Michelle Obama, former President George H.W. Bush and former First Lady Barbara Bush, and Hillary Clinton. It is not clear if a live stream of Cook's commencement address will be available, but George Washington University does typically share videos of its commencement events on Vimeo shortly after they take place. The real presentation starts when Craig get up there. Bah! College is for chumps. and go out and get your start in the world. four or five years down the road than their school-going brethren will be. College/uni broadens your perspective on the world. You can have your opinion but that's all it is. "I know our graduating students will be inspired and enlightened by his reflections on the lessons he has garnered from his distinguished career as a highly effective leader at the forefront of technological innovation." What a bunch of pedantic bullcrap. Apparently nobody taught this guy about run-on sentences. How do colleges/students bring in big name speakers like this? Cook will have a hard time outdoing Job's Stanford speech. Jobs speech was fantastic and pretty much devoid of politics. I have a feeling Cook's won't be. I'm sure there are other ways to broaden your perspective on the world. Like perhaps going out into the world. I hope you're right. Then it will be even better than Jobs' speech. I'm sure Tim Cook will deliver an inspiring Commencement address, but awarding him an honorary doctorate in public service? Apple is a for profit company and there's nothing wrong with that -- but I fail to see the public service aspect. My sister lives in DC. I may make the trip down there. Plus the Yankees are playing the Nationals that weekend. This company is now run by Cook & he doesn't need Jobs anymore to compare. Fact is, Cook has grown Apple more & faster than Jobs ever did. Plus, from everything I've ever read, heard & seen, Jobs was a tough SOB to work for. He loved to put people down & make them feel like s***. Tim Cook does't need to do that. Cook is a great choice for this honor. Statistics say that every year of college increases income. Yes, even for liberal arts degrees. Of course there are entrepreneurs who "make it" on their own and that's great, but it's not the average. And anyway, there are other reasons to go to college besides making money or landing a job. It used to be about expanding your mind learning about the world, and it has always had a social aspect as well.